Although Dardenne originally indicated he wouldn’t offer an endorsement in the general election, the source said his thinking on the subject evolved over time. Dardenne and Edwards had been talking since election day (Oct. 24), when Dardenne and Republican candidate Scott Angelle were defeated by Edwards and U.S. Sen. David Vitter. “He went from ‘No I won’t’ to ‘I would if…’ to ‘I might have to,’ to ‘Let’s do this now,'” the source said. Both Dardenne and Angelle, were the subject of withering political attacks during the primary launched by U.S. Sen. David Vitter’s campaign and the super PACS supporting him. Angelle struck back hard, and Dardenne complained bitterly about the ads during the last two weeks of the campaign during debates before running an ad criticizing Vitter in the last days of the campaign. Dardenne finished fourth in the primary with 15% of the vote. Both candidates remaining in the governor’s race — Democrat John Bel Edwards and Republican David Vitter — have repeatedly criticized Republican Gov. Bobby Jindal on the campaign trail. And it appears Jindal isn’t eager to pick which of the two he would prefer succeeds him in the Governor’s Office. The National Review caught up with Jindal in Boulder, Colorado, on Wednesday and asked whom he prefers. 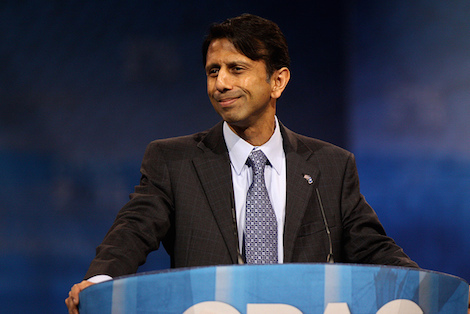 Jindal has frequently butted heads with both men. It’s no secret that Jindal and Vitter have an icy relationship. And as chairman of the House Democratic Caucus, Edwards has been one of Jindal’s most vocal opponents at the State Capitol. The bigger question may not be who Bobby chooses to endorse between campaign events in Iowa, but rather whether either candidate would accept his support.